No doubt, our climate system is complex and messy. Still, we can sometimes make some inferences about it based on well-known physical principles. Indeed, the beauty of physics is that a complex systems can be reduced into simple terms that can be quantified, and the essential aspects understood. A recent paper by Sloan and Wolfendale (2013) provides an example where they derive a simple conceptual model of how the greenhouse effect works from first principles. They show the story behind the expression saying that a doubling in CO2 should increase the forcing by a factor of 1+log|2|/log|CO2|. I have a fondness for such simple conceptual models (e.g. I’ve made my own attempt posted at arXiv) because they provide a general picture of the essence – of course their precision is limited by their simplicity. 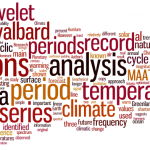 A number of blogs were excited after having leaked the second-order draft of IPCC document, which they interpreted as a “game-changing admission of enhanced solar forcing”.